Ballymena's Jonny Addis celebrates after the game. Regardless of what David Jeffrey says, Ballymena United are genuine title candidates. 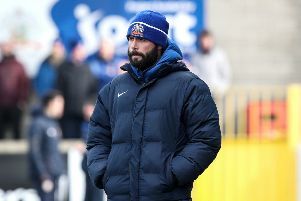 Yes, the team are riding the crest of a wave at the minute having topped the Danske Bank Premiership table and, yes, they’ve written themselves into the record books by clocking up their ninth successive victory. But most of the spectators shoehorned into the Warden Street Showgrounds on Saturday will realise that this is no ordinary Ballymena United team. It’s a group that are prepared to roll up their sleeves to do the nasty side of the game, in terms of work rate and determination, when things are not going according to plan and then have the skill, technique and class to get them over the line when it matters. It can be argued that the big tests have still to come, but they don’t come much bigger than Linfield. The Sky Blues are now 14 games undefeated in all competitions – a statistic that any team in the league would be proud of. Make no mistake about it, they are sitting pretty at the top in merit – Saturday was a testament of that. Teams have a tendency to drop their heads when conceding an early goal, especially against Linfield. Andy Waterworth’s finish was empathic after Stephen Fallon cut the ball back from a seemingly impossible position. But with Jeffrey’s team talk still ringing in their ears, United came out for the second half with all guns blazing. They were back on terms on 52 minutes. Steven McCullough whipped in a delicious free kick and, Johnny Addis capitalised on goalkeeper Roy Carroll’s misjudgement, to bullet home a header into the empty net. The adoring Ballymena fans, including legendary broadcaster Jackie Fullerton, were still celebrating when they struck again seven minutes later. This time Cathair Friel sent Leroy Millar hurtling into the box and, after cleverly pulling the ball back on to his left foot, he rammed home a beauty into the bottom corner, beating Carroll at his near post. It could have been worse. The big former international produced two outstanding saves to deny Friel before somehow beating away a blockbuster from Tony Kane. The celebrations at the finish were extraordinary. The home fans were signing and dancing . . . the players were hugging and back-slapping. So, it promises to be some party should United go on and finish the job at the end of April!